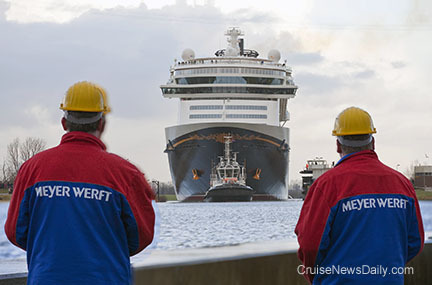 When a ship is built in the inland yard of Meyer Werft, its first journey is always the conveyance down the Ems River to the Dutch seaport of Eemshaven. 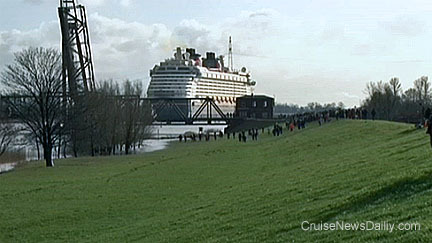 There is a tremendous sense of pride of the Meyer Werft product in the region, and a conveyance is always cause for people to come down to the river to watch the giant ships pass. The journey is always a slow, methodical trip through narrow locks and drawbridge, and down the shallow river. Because of the treacherous conditions, the timing is always subject to change due to the weather, wind and tide conditions. For that reason, today's conveyance was suddenly moved up almost twelve hours to take advantage of better conditions. 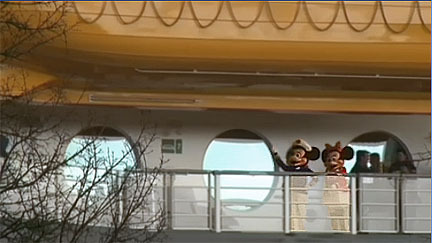 Disney Fantasy left Meyer Werft about 9:00am this morning (January 20, 2012). While looking at the photos, it's easy to forget how things are actually happening. 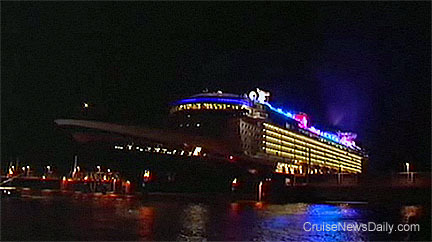 Disney Fantasy traveling toward the camera as it passes Weener. is on Meyer taking advantage of the better weather conditions. 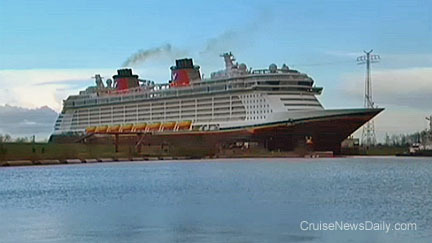 Disney Fantasy approaches Leer in the late afternoon. there is on each side of the side of the ship. 9pm, and still people come down to the river to watch the ship pass. 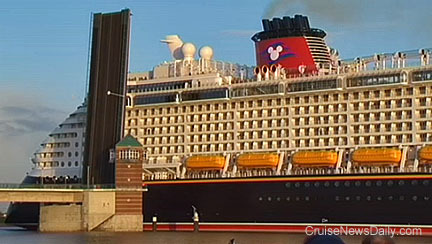 Disney Cruise Line had scheduled a major announcement in Miami today, apparently to announce the homeporting of a ship there beginning in December. The line decided to postpone the announcement until an unspecified date. 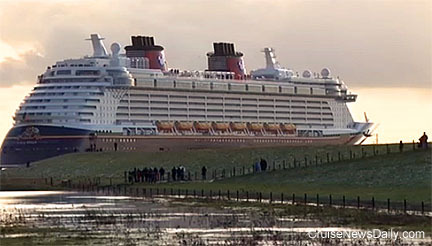 Although they didn't mention it directly, the delay likely was caused by the mood of the industry surrounding the sinking of Costa Concordia last Friday and the media attention on that. Please note that we are continuing to update information about the Costa Concordia incident in the original article's location so complete information will be available in one place. Latest updates includes information from Monday's press conference in Genoa with Costa CEO Pier Luigi Foschi, and an early morning release of the financial impact on Carnival Corp. Tuesday's updates included updated information on the death toll and the captain's first appearance in court. MSC Cruises announced this morning they would move their South Florida home port from Port Everglades (at Ft. Lauderdale) to the Port of Miami beginning in the fall of 2013. 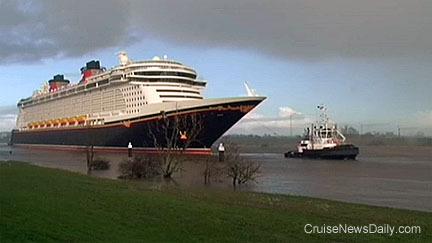 The complete article appeared in the January 16, 2012, edition of Cruise News Daily.